In addition to Richard Branson's lofty ambitions in space, the entrepeneur-explorer also has a project to send paying customers to the bottom of the ocean. Or, rather, had: it seems that very quietly, and with none of the fanfare surrounding the original launch, Virgin has shelved its current deep-sea project. From a report in the Telegraph, it seems that Branson's ambition was writing cheques that his (licensed) technology really couldn't cash. 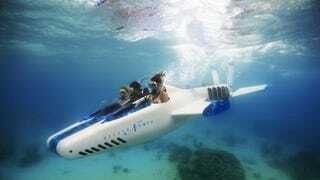 While Branson was announcing that the DeepFlight sub would be making return visits to the bottom of the ocean, and talking about selling tickets for $500,000, the manufacturers were insisting that the sub was single-use only. "As soon as we heard about the five dives and that they wanted to repurpose it [the submarine] and sell tickets, we didn't want to be associated with that. They were trying to sell tickets; they wanted to charge half a million dollars. We were extremely concerned about it… We didn't want the liability of being the manufacturer of that vessel. Had the focus of the project been maintained to the initial purpose, it would have been totally different. The problem was not the technology or the lack of knowhow."